Being able to share your riding experience with a pillion or another rider as you go along is, to me, one of the best things about riding. Riding across new territories, or just enjoying a nice ride on local roads is enhanced by the possibility to share thoughts with the person who is going through the same experience. It is also great to be able to communicate to kill the boredom of highways or just to plan a pit stop. The first trip Louise and I did in California in 2010 highlighted the need for an intercom. I first decided to go for a middle of the range BT Interphone Bluetooth unit. It was the first generation of motorcycle Bluetooth intercoms and frankly I was disappointed. It was OK to chat while in town, but at speeds over 40mph the road noise covered up any sound coming out of the weak speakers. Next on the list was a fully wired Starcom Advance system which was excellent. I installed it on the Nomad and it served its purpose brilliantly. The Starcom unit is really HiFi; the sound quality is great and features such as noise reduction, automatic volume adjustment etc made for a great intercom to use with a pillion. We took it to Spain, France, around the UK and I also took it with me to South Africa where I installed it on our R1200GS. There’s something special about riding through the Prince Alfred Pass listening to Paul Simon’s Graceland album and sharing thoughts with your better half in the pillion seat. The only drawback is that one has to plug in and out every time; but this is offset by the fact that it’s all installed and does not need to be recharged every night like Bluetooth systems. I had to review my options when Louise passed her license and started riding her own bike. All of a sudden we couldn’t speak anymore, only at traffic lights. The joy of riding together on two bikes was dampened by the fact that we couldn’t share our experience of the road. 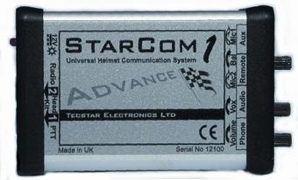 I looked into two-way radio systems and bought a new Starcom system for Louise’s bike. I never managed to make the Starcom work with the two-way radios and gave up. 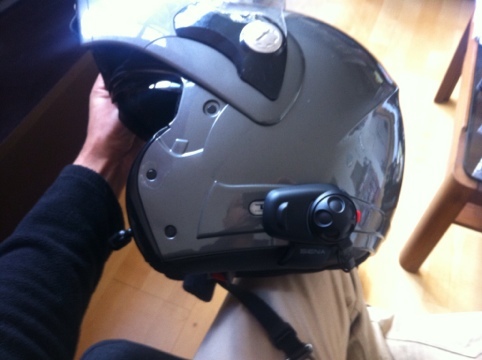 Instead I bought a helmet mic/speaker set which directly plugged into the two way radios which we kept in our pockets. This was operated with a PTT (push to talk) button velcro-ed to the handlebar… not great. It was bulky, had bad sound quality and frankly it was a bit dangerous to have to press a button every time you want to speak. There was a cable going from the PTT button to the radio, and another from the radio to the helmet… We used this system twice and I dumped it. “Serious” riders like us need something much better than that! I think that in this case you get what you pay for so I decided to invest in a more upmarket, new generation Bluetooth solution. In comes the Sena SMH-5. I always thought that the Bluetooth option was great because of the size of the units and the lack of cables. They are also extremely portable which is great for riders like us who often rent motorcycles abroad. The first generation failed because the sound quality was not good enough, but all the reports I read were saying that the 3rd and 4th generations of Bluetooth intercoms were now much better. I read WebBikeWorld’s review of the SMH-5 which convinced me. It promised excellent sound quality, easy use and durability priced at only £170 for the dual set. I was one of the first person in the UK to get my hands on one, having been shipped one by the very helpful Cliff of Two Wheels Trekkers. My first impressions are of very good built quality, ease of use and great sound. One of the features I really like is the ability to pair it to my iPhone and make my musical choices through voice commands. Some people may think that listening to music while riding is less than ideal for safety reasons but I think that there’s a time and a place for it. It can be totally safe to listen to your favourite music in the background while riding on long empty roads. The SMH-5 allows you to play/stop/change volume very easily with gloves on using the clever Jog-Dial, so there’s no distracting fiddling. Louise and I tested the SMH-5 on a short ride in town. I was impressed by the sound quality; also, being a full duplex system, sound is always being transmitted. This, in my opinion, is much better than the VOX systems which usually eat into your first words and can be quite frustrating. 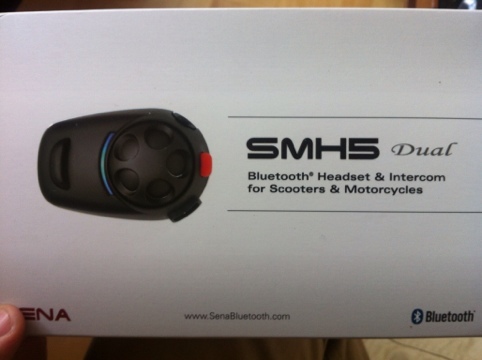 This said the SMH-5 is very good at filtering ambient noise and only transmitting the rider’s voice. I wasn’t very impressed by its range though; we got cut off at about 100 meters, but to be fair, we were out of sight with cars between us. I suspect that the range will be much longer on open roads. In any case, we like to ride fairly close to each other and the SMH-5 is more than capable to handle the distance between our bikes. That said, if we do get separated and cut off, and we need to speak to each other to regroup, all we need to do is to call each other by telephone using the voice command feature. In conclusion, I would certainly recommend the SMH-5 to anyone looking for a high-end Bluetooth intercom at mid-range price. It provides great sound quality, great connectivity, robustness and adequate range. All that at a very reasonable price but it doesn’t stop there; Sena will provide regular firmware updates which means that your intercom will become better with time!